Amante, Andante, and Krazy Lady. Allan Cay Pensacola’s tatty beach side shack, is waggishly dubbed the “Allan’s Cay Hilton” by some witty cruiser armed with a wet paintbrush. Comparatively, Ragged Island Hog Cay’s set-up is the Ritz Carlton. 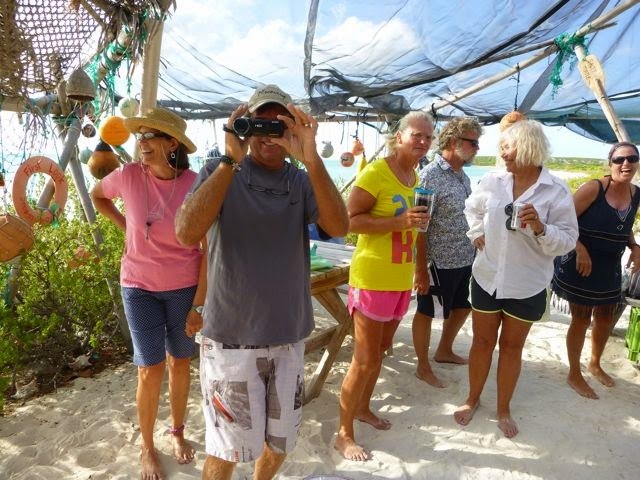 Dangerously shallow and remote, with storms clocking every possible direction over several days, Hog Cay is well beyond where most intrepid Bahamas cruisers cruise. For those scrappier types who venture there, that’s part of the draw; -- its pristine beauty (though the Atlantic side was marred, like most beaches throughout the BAHAMAS, with multitudes of swept in with the tide from distant shores). It's not a potluck without the food! 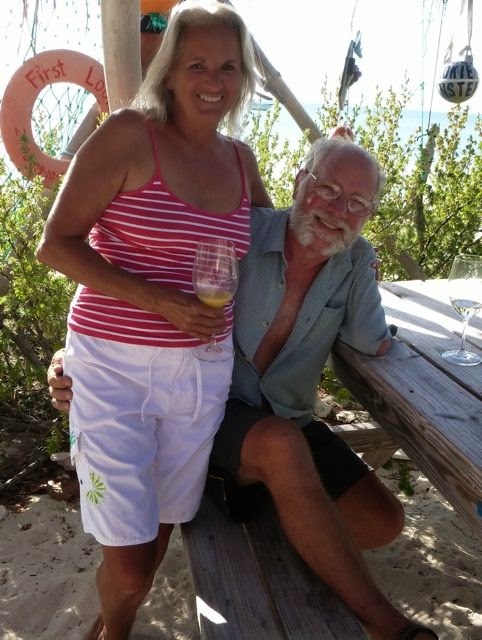 From Hog Cay, a trip into Duncan town -- population 70 -- the only “town” in the far-flung 110 mile island chain known as The Raggeds, is a choppy 45-minute ride each way with our dinghy’s puny 4-horsepower outboard motor. Our first trip in provided ample entertainment for the locals when we mistook the shallow water stick for the entryway to the navigable dredged ditch through the mangroves into town. We half paddled our way through the shallows bumping along through an extra low, low tide, discovering the way we should’ve taken after we arrived. Newlyweds Ken & Louisa are all smiles. 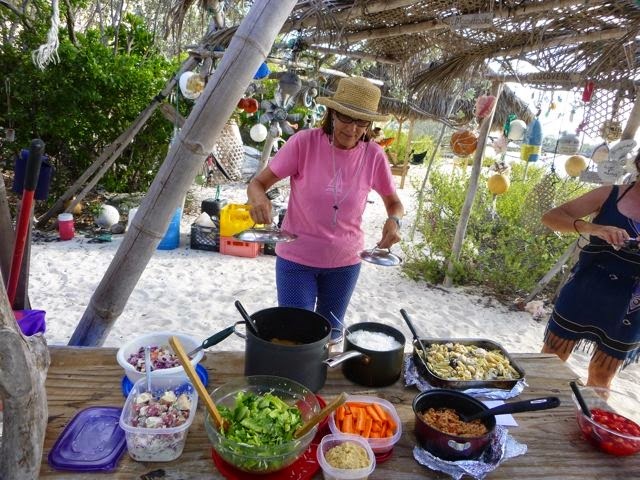 Maxine, proprietor of the one minuscule grocery/drugstore in town (when she’s not too busy fishing), astutely built Hog Cay’s simple yet welcoming plen air enclave. 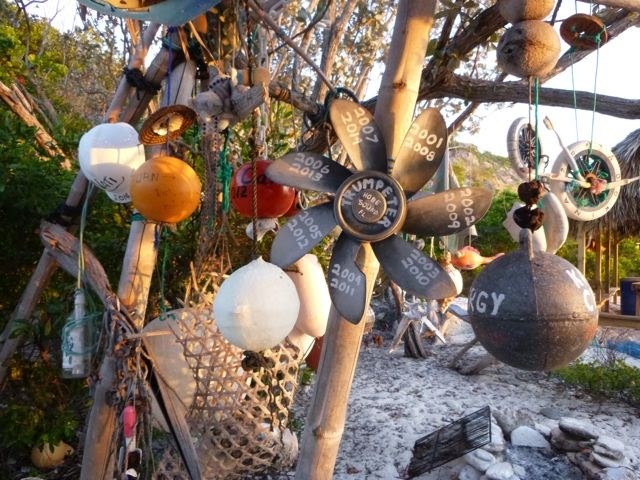 This oddly homey outdoor rumpus room’s comprised simply… a makeshift driftwood framework with an open net ceiling adorned with clever cruiser “Calling cards,” scattered tables, benches, battered and makeshift chairs, a fire pit, a serving area, and a few solar lights. It’s the perfect magnet for cruisers ready for sundowners and other delightful social get-togethers on the beach. It’s clear from drums and junakanoo garb under the adjacent, small thatched roof stand, the locals enjoy this little getaway, too. As cruisers, we may want to get away from it all, but necessarily each other, at least as long as we’re kindred enough spirits and not too big a crowd. In fact, we were interlopers, still graciously included by small groups of “buddy boaters” (cruisers traveling together on separate boats). Beautiful, balmy Bahamanian days brought us together or Mah jong and cribbage (click here to to read about the instigator), potlucks, and hiking, a champagne toast to the newlyweds, tips on where to find conch (Raggeds are remote enough they are far less conched-out – at least for now) and enjoyable conversations about life in general, sharing a sunset at the end of a full and happy sun-drenched day…. Thank you Maxine, for creating a congenial play space where we connect in meaningful ways not only with nature, but also with each other, as heartfelt human beings. Sampling of cruiser "calling cards" at Hog Cay. 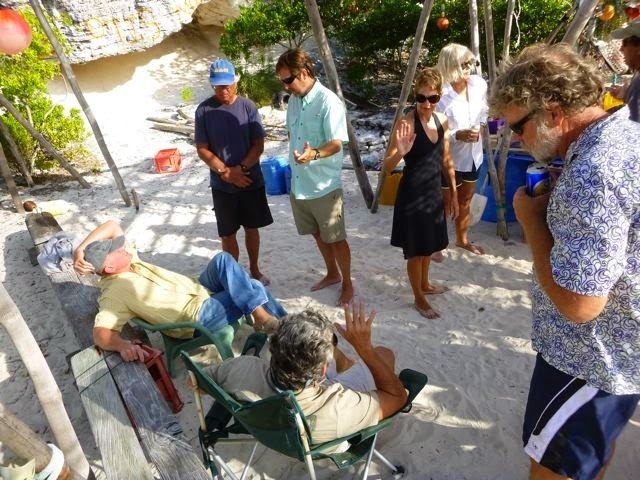 Recent retrospective from our time in Hog Cay, Ragged Islands, BAHAMAS (N22.14.920 W75.45.106), March 31 – April 5 2014. Meanwhile, we’re temporarily land-bound in Jacksonville, FL, where our boat is on the hard at Green Cove Springs until November. We’re in the throes of planning our next big cruising adventure, to the South Pacific; lots of checklists! The countdown’s begun!